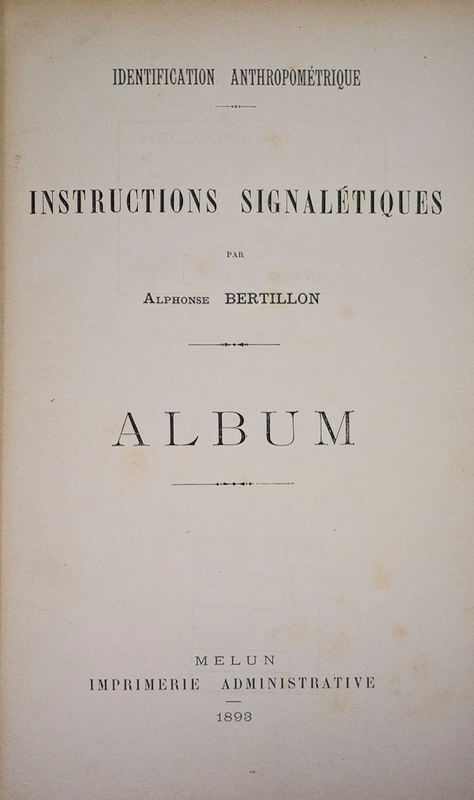 Another fascinating book from the NYAM’s holdings is French criminologist and anthropologist Alphonse Bertillon’s Identification anthropométrique; instructions signalétiques of 1893. Alphonse Bertillon (1853–1914) invented a criminal identification system using photography and physical measurements which allowed police to document and convict repeat criminals. His system was called signaletics or bertillonage and involved recording certain traits, such as measurements of the head and body and the shape of the ear, and converting them into a unique formula. The formula was paired with a photo of the individual and filed. The system was successful and widely used, but errors were possible, since different officers might obtain different measurements and bodies can change, and eventually fingerprints became the preferred method of identification. Bertillon also introduced the systematic use of photography to document crime scenes. The reductionism of such medicalized views of the body went on to inspire the works of the surrealists, as seen in works such as Salvador Dali’s “The Phenomenon of Ecstasy” (see last image) of 1933. This entry was posted in Collections, History of medicine and tagged historical collections, history of medicine, morbid anatomy, rare books by nyamhistofmed. Bookmark the permalink.